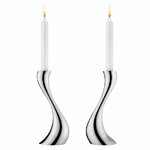 Georg Jensen's Cobra floor candleholders catch the eye with the shine of mirror polished steel. 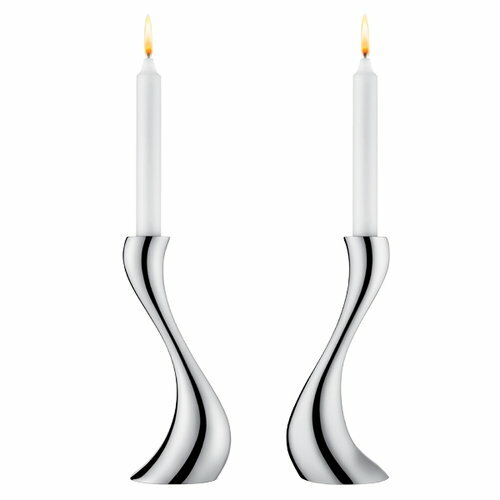 The organic lines of the candleholders resemble melting wax – almost as if a classic candlestick had started to melt. Designed by Constantin Wortman, Cobra collection is characterized by a swerving, dramatic appearance, and its strong curves create an impression of fast movement. Just like actual cobras, the members of the Cobra collection are imposing, striking and bold. With its mirror-polished steel surface and dynamic design, Cobra is a true design classic that adds a dramatic element to any interior. Constantin Wortmann studied design in Munich. After graduating he worked as an intern and a freelance designer for Ingo Mauer. In 1998 he founded the Büro für Form company together with Benjamin Hopf. The company works within interior, furniture, industrial and light design.